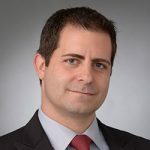 Anthony J. Zeoli is a Partner in the Corporate Practice Group at Freeborn & Peters LLP in Chicago, where he concentrates his practice in the areas of banking and commercial finance, securities, real estate, and general corporate law. He also is an industry leader in the area of crowdfunding, in particular with respect to real estate crowdfunding, peer-to-peer (P2P) lending, and Regulation A+ offerings. He recently drafted a bill to allow for an intrastate crowdfunding exemption in Illinois, which was unanimously passed by the Illinois General Assembly. He can be reached at azeoli@freeborn.com. 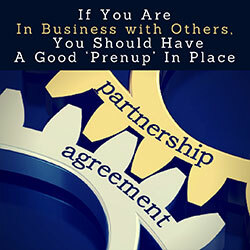 I always tell my clients who are currently working with, or who are considering working with, business partners that they should have a solid “prenup” agreement in place. Now when I say “prenup” in the context of a business relationship I am obviously not talking about a traditional prenuptial agreement. What I am actually referring to are the underlying agreements (e.g., operating agreement, shareholders/buy-sell agreement, voting agreements, etc.) that will govern the relations between you and your business partners. That being said, these documents and a traditional prenuptial agreement are alike in a lot of ways and often should be looked at in a similar vein when preparing. Let me explain. I work with a lot of entrepreneurs and startups and one of the points that I always stress is the importance of having a solid operating agreement in place when working with partners. Now, before I continue, let me say that I will talk in terms of an “operating agreement” for ease of discussion and because limited liability companies (LLCs) are the preferred entity choice for many entrepreneurs. That being said, the same issues that I will discuss here would apply equally in a corporation context (where the corresponding documents would be a shareholders/buy-sell agreement and the corporate bylaws) or a general/limited liability partnership (where the corresponding document would be the partnership agreement). Honestly, I cannot tell you how many times a client has come to me with absolutely no operating agreement or, worse yet, some random Internet downloaded form of an operating agreement. To many entrepreneurs, the importance of drafting a properly tailored operating agreement is completely lost. In their eyes it’s just another random legal formality where they fill in the blanks, throw it in a drawer and forget about it. This is absolutely the wrong attitude to take with respect to drafting an operating agreement and it is why I encourage my clients to think of it as a prenup between them and their partners. What happens if your married partner gets divorced and their spouse gets the company interest (g., will they still get to keep their ownership or be forced to sell it back). I literally have a six-page memo that I hand my entrepreneur clients outlining some of the major issues to consider when drafting their operating agreement and time after time the response is, “WOW, I wouldn’t have thought of half of these issues.” Of course they wouldn’t but that is because it is not their job to think of these issues, it’s their attorney’s job. The key is being smart enough not to try to do your attorney’s job by grabbing some random form from the Internet and running with it. There are always matters specific to the partners involved that just cannot be covered in any general form agreement. For example, one issue that arises all the time in startup situations where one partner comes in with a particular idea/technology/etc., is who gets the rights to that intellectual property if the company fails. General forms usually do not specify what happens to this intellectual property, meaning it typically will be treated as a general asset of the company, which may be subject to being sold off/liquidated/etc. upon the company’s dissolution. One of the questions I get repeatedly is, “Can’t I just do something simple now and get it done better later?” The answer is a weak yes and I’ll tell you why. I say yes because having something is generally better than having nothing, but there are several problems with the “I’ll fix it later” approach. First, the best time to discuss all of the major issues with your partners is at the beginning of the relationship when everyone is all happy-happy. It becomes increasingly more difficult to negotiate and compromise on issues when conflicts arise. Similarly, if you are considering taking on additional partners at some point, you will want to have these issues worked out before they come in. The more cooks in the kitchen, the harder, and more costly, these issues become to resolve. Finally, the “later” never seems to come with most clients because they simply so not see it as a priority, at least not until an issue arises between the partners. Here is a question for the reader: If you do not have a written operating agreement in place, what governs your relationships with your partners? If your answer is some unwritten agreement or understanding that you have with your partners, you are in for a big surprise. Every company is governed by the laws of the state in which it was formed and each state has its own unique laws regarding the management of the company and the relationships between the owners of the company. While many of these rules can be modified through the use of an operating agreement, if that agreement is not in place or otherwise does not cover a particular issue, the company and its members would still be subject to the default laws of the state. Let me give you an example. Let’s say you and two partners form an Illinois “manager managed” LLC. You put in 75 percent of the money and your partners, together, put in 25 percent. The general understanding between you and your partners is that, because you put in the majority of the money, you would be the manager and control the company so you never draft an operating agreement. Things get heated between you and your partners, and they want to fire you as the manager of the company. You laugh, of course, and say that you control the company, and they have no power to fire you. Guess what? You would be WRONG. Under Illinois law, unless otherwise changed in an operating agreement, the manager of a manager-managed LLC can be appointed or removed by “a majority of the members.” Applying this rule, it doesn’t matter that you put in 75 percent of the cash, only that it’s your two partners against you and they have the majority. This could have easily been remedied by a properly drafted operating agreement but, since one was never put in place, you would be out. The laws of each state vary significantly and unintended results as illustrated in this simple example can and, I guarantee, will result, if you do not have a proper operating agreement in place. The takeaway here is simply to spend the time and money necessary to get a solid operating agreement in place. I am not saying that you need to spend tens of thousands of dollars, or have a 100+ page document created – just something that adequately covers the major issues that ultimately can, and will, arise when getting into business with others. To save costs it’s fine to take something off the Internet (or LegalZoom, etc.) and try to start the process yourself, but you absolutely should engage an attorney to look it over and help you finish it. An improperly drafted agreement can have the same effect as no agreement at all and you will again be subject to the applicable state laws which may not be favorable to you as illustrated above. At the end of the day the best of relationships can have conflicts, and having an agreement in place with provisions designed to address those conflicts truly helps keep everyone on a level playing field as you will all know what your rights are, and will be. As I said, it’s much like a prenup in that you won’t have to yell and scream over who gets custody of the dog when the agreement already says it goes to you.